On the auspicious Raksha Bandhan occasion celebrate the spirit of brotherhood and sibling love with intricately crafted rakhis at Sendrakhi.com. Our Archies Rakhi collection includes a host of combinations of eye-catching rakhis crafted from pearl, beads, Rudraksha packed with a box of chocolates, dry fruits or an array of Indian sweets such as motichoor laddu, kaju katli, soan papdi, rasgullah or gulab jamun. Find an all-inclusive range of rakhi gift combos and hampers at Sendrakhi.com. The Archies gift hampers include combinations such as an exquisitely crafted designer rakhi with chocolate or Indian sweets. Some of the rakhi combos even include German silver plates and bowls. Choose a hamper according to your brother’s preference and your budget of course. 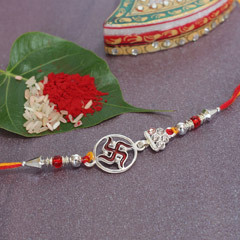 Sendrakhi.com offers various modes of delivery to send your rakhi promptly to your brother staying in Hyderabad by availing any of our delivery modes, such as standard delivery, midnight delivery or fixed time delivery. We deliver to any of the cities of India such as Delhi, Bangalore, Kolkata, Gurgaon, Bangalore, Chennai, Lucknow, Mumbai etc. Avail our special midnight delivery service to ensure your rakhi and gifts reach your brother on time. With our splendid Archies rakhi collection have a wonderful time online shopping for rakhi gifts to surprise your brother in Hyderabad with his favorite pearl rakhi and mouth-watering Kaju katli. Sendrakhi.com has come a long way in last few years with its exceptionally helpful services. On the basis of the 1100 reviews from our esteemed customers, the support team has received a rating of 4 stars.